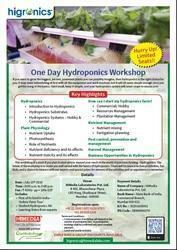 Offering you a complete choice of products which include hydroponics workshop. A one day express course in Hydroponics (soil less cultivation) with hands on practicals and a visit to a Indoor farm lab, ideal for hobbyist or those interested in commercial growing. Fees include starter kit, notes and meals.